American University’s core mission is the education of its students. This point is not overlooked by the Facilities Management team who work daily to maintain a positive living and learning environment at AU. They take the university’s core mission a step further by engaging students in collaborative efforts to provide opportunities for practical exposure and interaction with the Facilities Management energy team. Such efforts are designed to offer students greater insight about energy efficiency at AU and beyond. 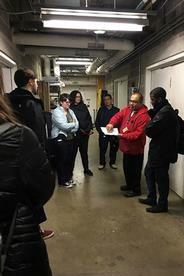 For the third year, Facilities’ energy management staff has collaborated with AU Professor Victoria Kiechel of the Global Environmental Politics program to lead graduate students studying LEED on a tour of the Katzen Arts Center’s mechanical room. The tour exposes students to the mechanical systems and the types of energy efficiency practices that they study about in their coursework in Professor Kiechel’s classes. Kiechel’s course dives deep into the nine categories of LEED (Leadership in Energy and Environmental Design) for which a building can attain points, including water conservation, innovation, and materials and resources used within a facility. Discussion of these categories takes place during the tour of the Katzen Arts Center’s mechanical systems. Katzen Arts Center is an ideal venue for a LEED class, as it presents a number of real-world challenges. Constructed in 2005, the building is not LEED certified and is one of the largest energy consumers, per square foot, on the AU campus. The building was designed as a multi-purpose space for classrooms, art galleries, studios, and performing arts spaces and, as such, creates unique challenges for energy efficiency and benchmarking. The building’s envelope, atriums, lighting, ventilation, temperature, and humidity are all factors involved in modelling and managing its energy efficiency. An added concern unique to the building is that it also must align with the exacting requirements of an arts facility. As a result, the facility offers significant opportunities for Facilities Management and students to collaborate and explore energy-efficient solutions. Katzen’s construction, purposes, and occupancies all underscore the fact that every building brings its own unique challenges, and “blanket solutions” to improve energy rarely exist. Katzen’s boiler room may take students by surprise, especially if they have not entered a mechanical room before. A 13.5-foot tall boiler heats both Katzen and Nebraska Hall, as needed. The shared boilers for both spaces are an example of an energy-efficient practice highlighted in the mechanical room tour. The tour also illustrates the scale and configuration of the equipment, since videos and textbooks reveal only a limited perspective. Expanding on the concepts that Professor Kiechel teaches, the tour provides specific examples of energy conservation measures. In a pre-tour presentation, the energy team offers a background of practices that AU takes to optimize energy efficiency, including the campus temperature policy, the monitoring of building energy usages, and tracking building heating and cooling schedules. The team details how every building has its own unique needs. Students also are introduced to Lucid, one of the online energy-tracking database tools that Facilities Management uses. Students can see heat maps that outline the “holiday curtailment” energy savings captured during winter break. Students then meet the plant operating engineer, one of the many who are responsible for monitoring and operating the campus’ mechanical systems. The engineer joins the tour and answers any technical questions that students may have. One interesting fact that is revealed in the tour is that operating buildings is a job that demands staff on campus 24 hours a day, 365 days a year. The Facilities staff have a dedicated team who monitor temperature levels on equipment, complete multiple walkthroughs, and collect manual readings of the various systems. Students have an opportunity to see the same display screens on chillers, boilers, and other devices that engineers use to collect data. After the tour, students are encouraged to think critically about energy efficiency when walking across campus. Regardless of whether it is an old or new building, all mechanical equipment play an influential role in campus energy efficiency. By collaborating with professors like Victoria Kiechel, the AU Facilities Management team is able to educate students on the behind-the-scenes energy savings strategies linked to the operations of building mechanical systems. Both Kiechel’s course and the tour align closely with AU’s goals for energy efficiency and the AU green building policy that requires all new construction to meet LEED Gold standards. Facilities Management understands the value of aligning itself with AU’s education mission and supporting faculty and students’ efforts to maximize the AU academic experience. The Energy Team continues to seek out opportunities to engage students in dialogue on AU’s behind-the-scenes operations through in-class presentations, field trips to one of our mechanical rooms, and working to develop potential internships as a way for everyone to continue to become more educated and energy efficient.